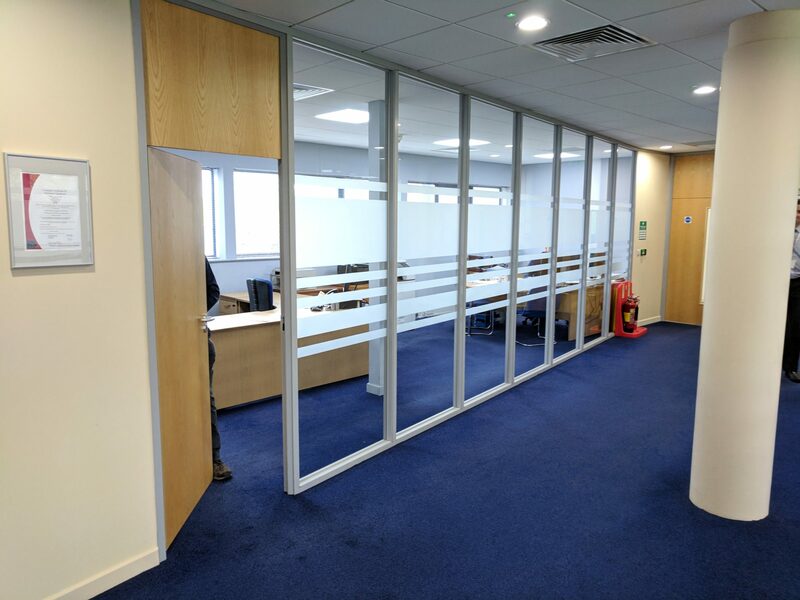 Have your glass partition walls installed neatly, promptly and to budget. 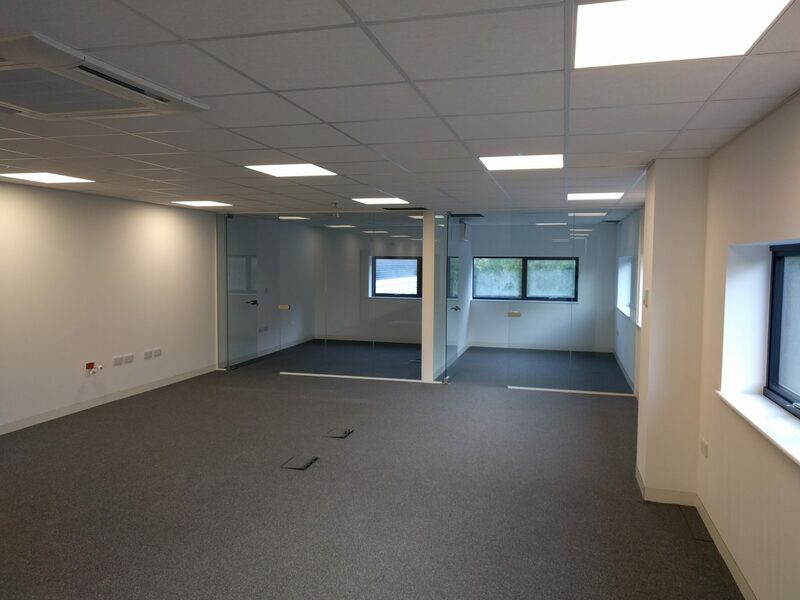 Glass office partitions can be single or double glazed, have integral venetian blinds, timber or glass doors, and have a variety of glazed module styles. We work with directly with business end users, as well as a sub-contractor. 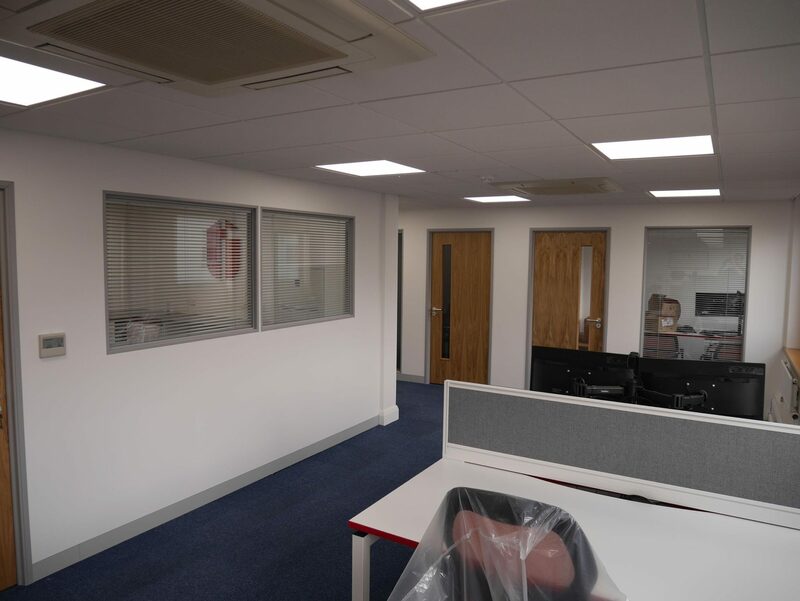 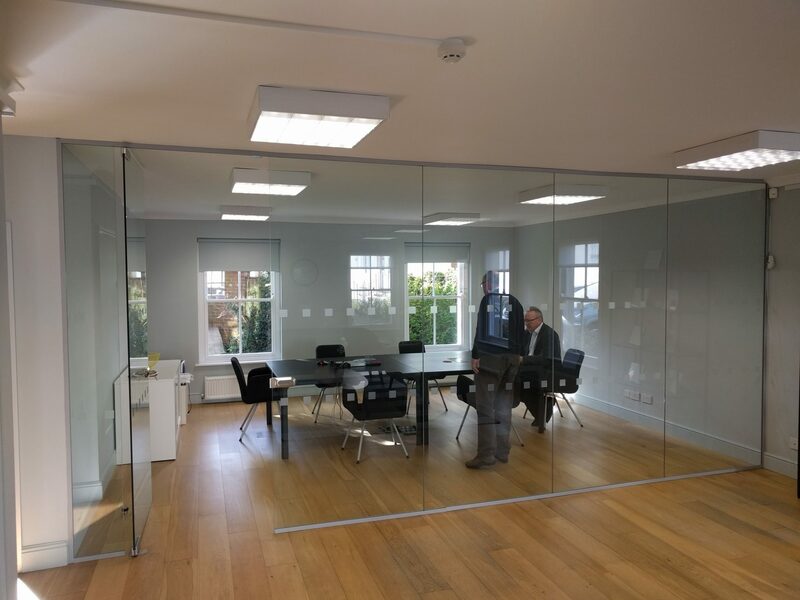 Our project sizes vary from forming glass screens to creating a range of offices or meeting rooms incorporating various different styles of glazing. 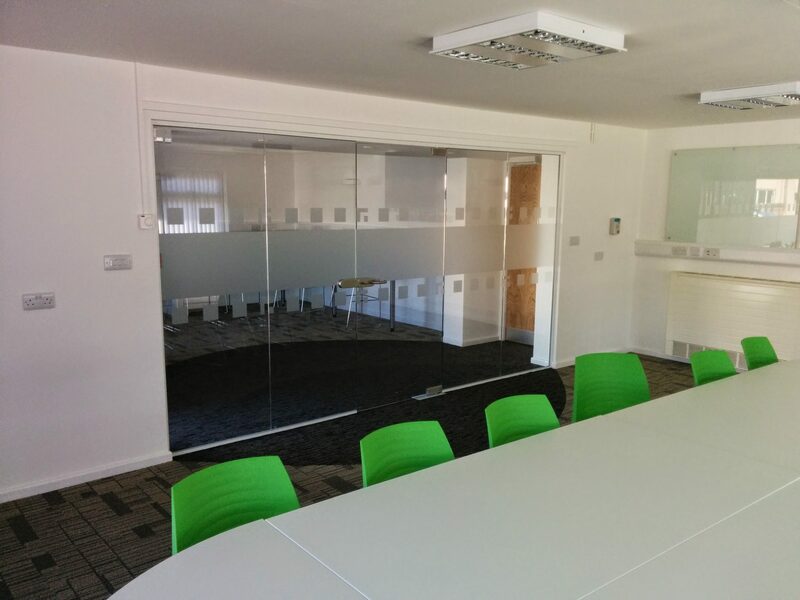 Arrange a site survey and we’ll offer what help and advice we can. 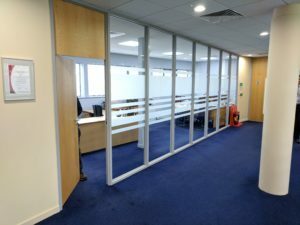 With a wealth of different systems available to our customers, there is a solution for everyone! This page is about glazed partitioning systems, however we also install frameless glass partitions if that is the style you are after. 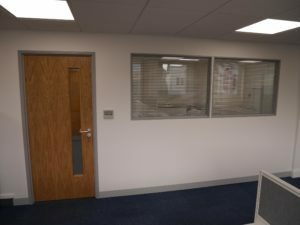 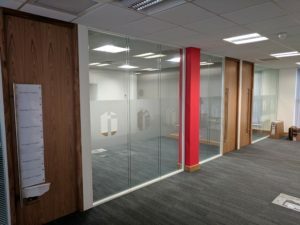 Glass office partitions are a quick and easy way to create new office space that can help create privacy when required (if you incorporate venetian blinds or privacy glass) whilst keeping the open plan feel to an office. 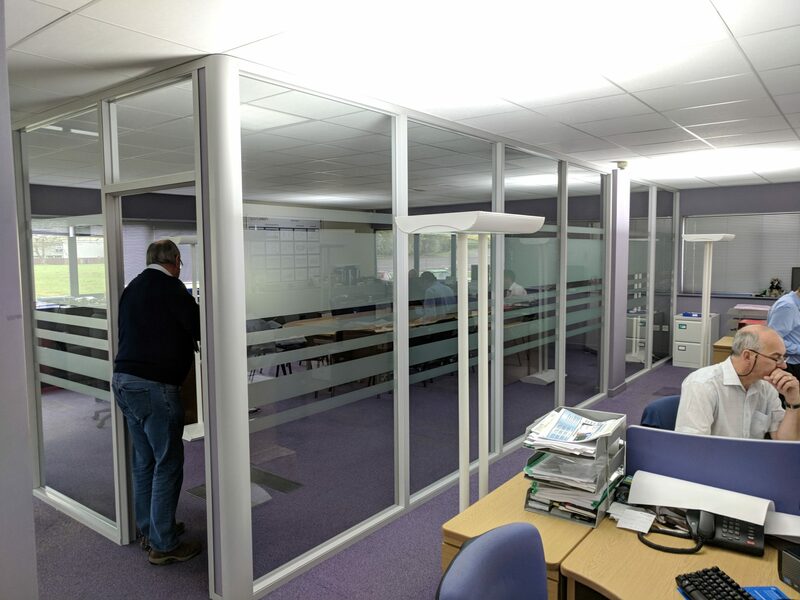 Glass office partitioning also allows you to keep natural light flowing through your office space. 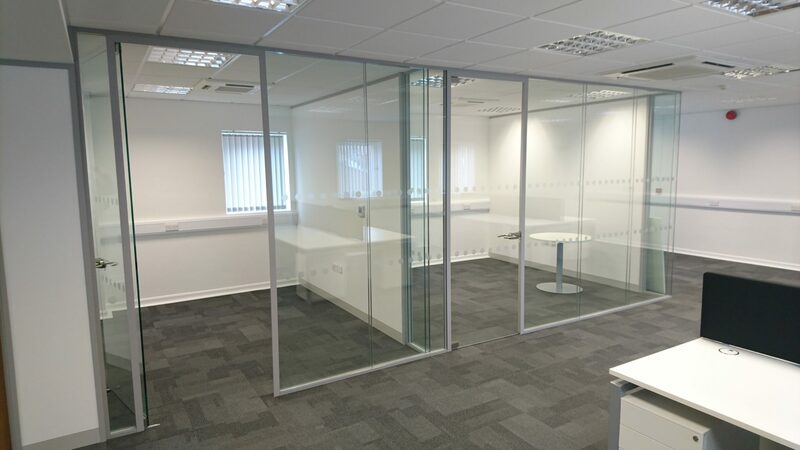 Glass wall modules can be incorporated into office partitions in a wide variety of ways, and all of these options can be single or double glazed. 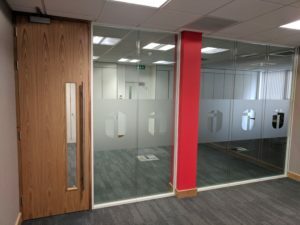 The glass could be full height, windows can be installed to half glaze the partition in a variety of different sizes and designs, sidelights to doors can be fitted, over panels of glass can be installed, or it could be glazed up to door heads; the style required will then dictate the partition system installed. 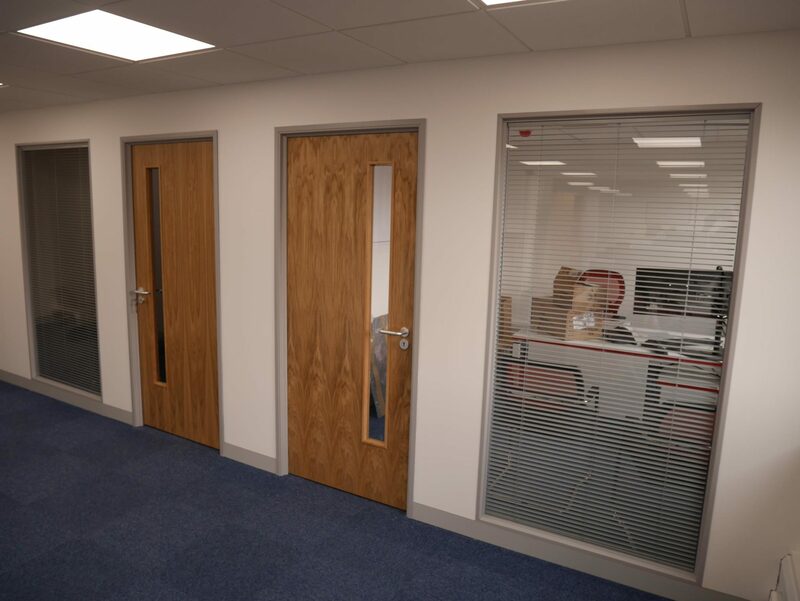 Depending on the system and the requirements you have, doors can be timber or glass (standard pivot doors or sliding doors). 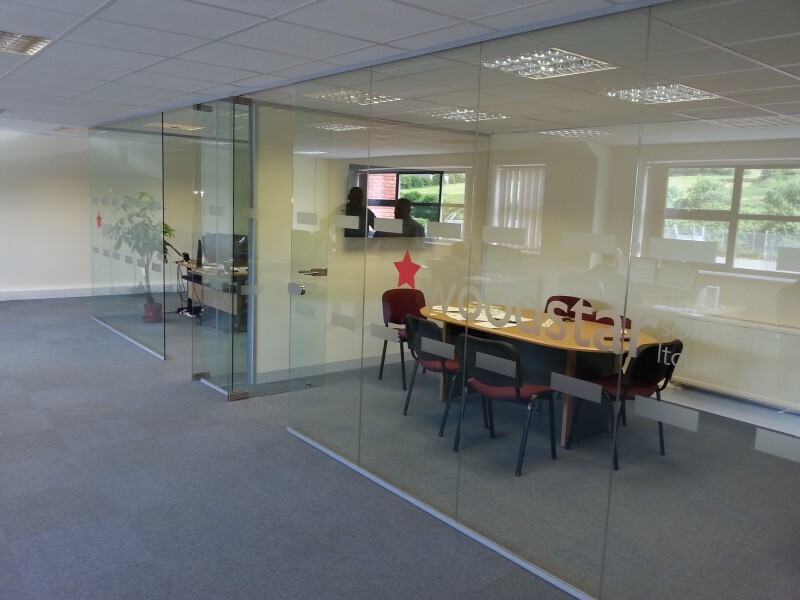 Frameless Glass Partitioning can create a stylish office environment. A frameless glass office can create a visual impact, it’s also a relatively quick and easy solution, especially when installed as part of an interior fit out. You can combine solid walls and frameless, to help create the perfect layout that you’re looking for. 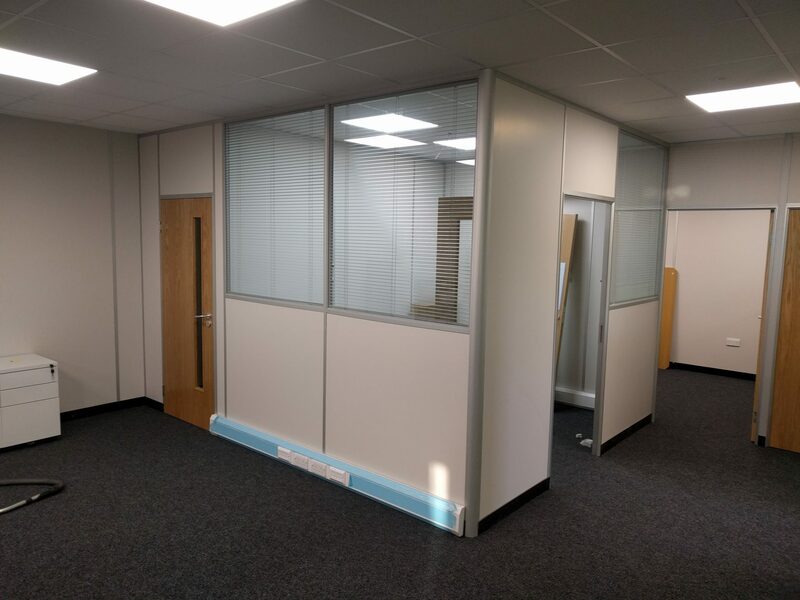 By having double glazed glass modules with integral blinds, or off set single glazed modules, you can incorporate colour coordinated integral venetian blinds into your partition. 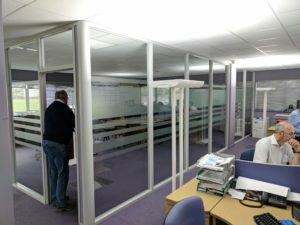 Allowing the users of the office to have privacy when required for meetings, appointments, or demonstrations. 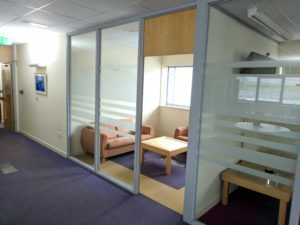 The blinds can then also be opened to allow the room to be visible and allow people to see in and out if required. 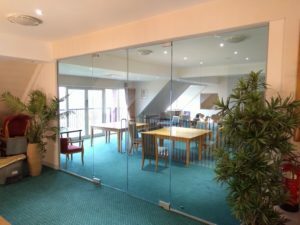 Depending upon the style of glass installed, manifestations may be required to be applied to the glass (in order to comply with building regulations / DDA). 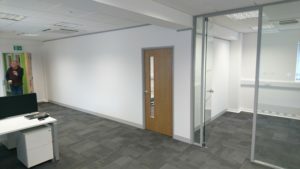 These can be simple dda dots or squares, through to a company logo or other design. Depending upon the requirements of where the glazed partition would be going, a variety of different glass would be used. 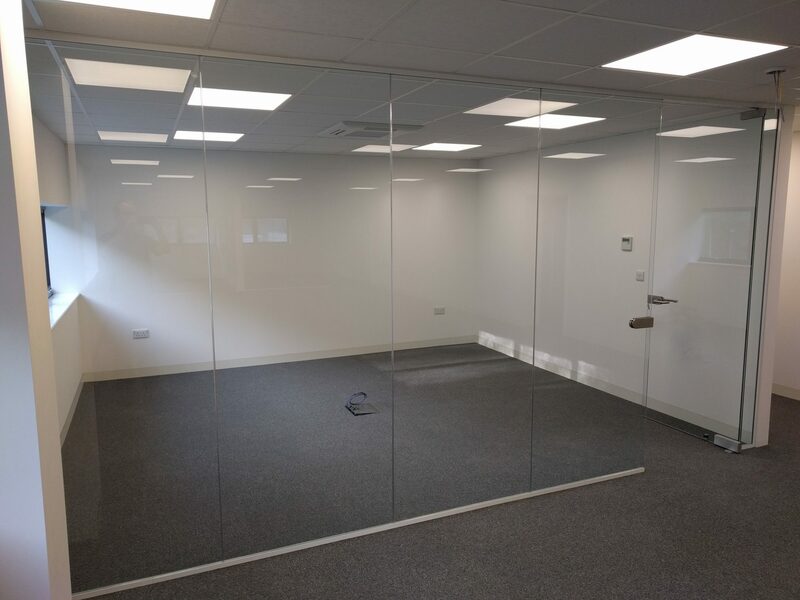 6.4 clear laminated would be standard used (this ensures the integrity of the glass by holding the pieces together should damage occur), with fire glass, acoustic glass, or toughened glass also available depending upon the requirements of the glass partition system chosen. Fire glass can be incorporated into a fire rated partition to create fire rating glass partitions. In order to achieve the rating specific components do have to be used correctly and in conjunction with each other. 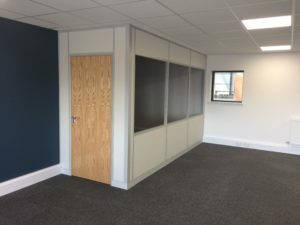 We also cover a wide range of related interior services so we can offer you one point of contact for all of your interiors works, if you’d like. For example we can take care of any decorations, electrical or mechanical works, ceiling or flooring works, to name just a few common items we regularly look after. If you’re after something else, just ask us. We’ll let you know if it isn’t something we can do for you. Glazed office partitioning may be called by a variety of names including; glass room dividers, glazed office screens, or simply a office glass wall. 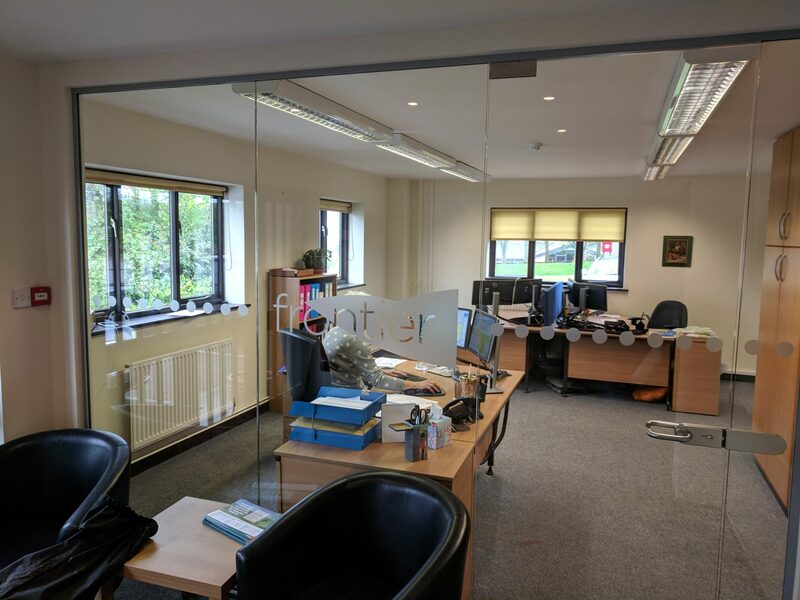 We primarily work throughout the Herefordshire and Worcestershire areas, covering for example Hereford, Worcester, Ledbury, Ross-on-Wye, Malvern, Monmouth, Leominster, Bromyard, and also into the Gloucester, Gloucestershire, Cheltenham, Evesham, Ludlow and Pershore areas. 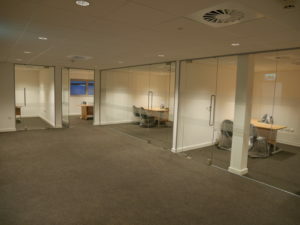 We do work further afield though, so please do ask us!